A child can be taught, from the age of three or four, the adhkaar to be recited in the morning and evening, and when going to sleep, eating and drinking. If a child hears these adhkaar, and memorizes and recites them, this will form a strong bond between his soul and Allaah, so his soul will develop and his nature will be sound and free of deviations. A family went on a trip to the countryside, and when they made a stop, their child went running around the countryside in joy. Then he quickly came back and asked his mother, “What is the dhikr that we should say in this place?” Of course, the dhikr he meant was that which was narrated from the Messenger (peace and blessings of Allaah be upon him): Khawlah bint Hakeem (may Allaah be pleased with her) said: “I heard the Messenger of Allaah (peace and blessings of Allaah be upon him) say, ‘Whoever makes a stop whilst traveling, then says, “A’oodhu bi kalimaat Allaah il-taammati min sharri ma khalaqa (I seek refuge in the perfect words of Allaah from the evil of that which He has created),” then nothing will harm him until he moves on from that place.’” (Narrated by Muslim). This child realized that there are specific adhkaar that the Muslim should recite, some of them are connected to certain times, some to certain places, and so on. 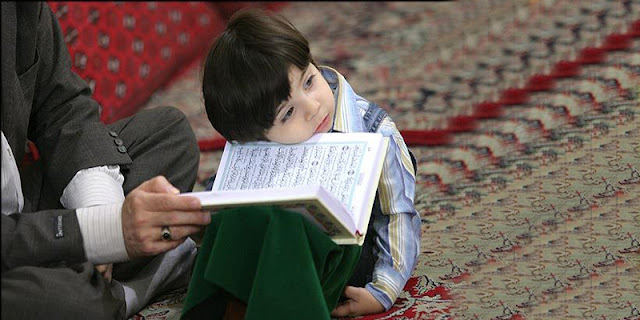 This child understood the real nature of the relationship with his Lord and realized that it is ongoing, because of what he had learned from his parents. If a child is brought up in such a manner, then he will be righteous, insha Allaah, and he will have an influence on his friends and those with whom he is in contact. Another story about a child growing up remembering Allaah and having a relationship with Him is that one day a small child who was just four years old came to his mother wearing new clothes that his thirteen-year-old sister had put on him. His mother said to him, “Let me teach you the du’aa’ for wearing new clothes.” The child said, “I have already said it.” The mother was surprised because she knew that the child had not yet learned this du’aa’. But the child told his mother, “My sister said the du’aa’ and I repeated it after her.” Look at the righteousness of this girl that had such an effect even on her little brother.